he has sent a message from prison. In Israeli ears, this message does not sound pleasant. I FIRST met Marwan in the heyday of post-Oslo optimism. women, who had matured in the first Intifada. services destroyed and many of its activists arrested. allowed anywhere near the accused. Palestinians, Fatah as well as Hamas, can unite. "terrorists" with "blood on their hands". reasons for a Netanyahu to keep him behind bars. uprising in the spirit of the Arab Spring. cooperation with the Israeli occupation authorities. cooperation, whether economic, military or other. security services with the Israeli occupation forces. of the growing Israeli settlements in the West Bank. "leftists" alike. It's political poison. isolate Israel (and the US) even more. to put pressure on both Fatah and Hamas. peace movement is not mentioned anymore. "Normalization" has become a dirty word. course, both in substance and in tone. Palestinian cause instead of furthering it. "settlement enterprise" goes on undisturbed. interest in Palestine. Everything looks quiet. One of the curious realities of modern America is how many people – especially white males – have been propagandized into siding with a “free-market” power structure that treats them like tissue paper, to be used and thrown away. Poet Phil Rockstroh says he encounters many such confused souls in his native South. To this day, I retain close ties to a number of Southern friends and contacts who did not ventured far from home. As the years trundled on, I’ve witnessed the quality of life and emotional well-being of these friends, hailing from both laboring and middle-class origins, experience a steep, accelerating decline. Emblematic of this situation is my strained-to-the-limit friendship with Vince (not his real name) who, due to the carnage inflicted on the U.S. laboring class by so-called free market “values,” has been chronically under or unemployed since the Wall Street bankster-perpetrated crash of late 2008. Yet Vince remains stubborn in his refusal to connect his dismal plight with the reality-resistant political notions he clutches. To this day, he describes himself as a “conservative libertarian — a proud believer in the values of the free market.” This conviction, coming from a member of the laboring class, is analogous to a slave proclaiming he is a believer in the auction block and the verities of his master’s whip. Worse, as the day-to-day humiliations exacted by the corporate state continue to inflict deeper, more emotionally debilitating wounds, the more Vince reacts like a wounded animal … lashing out at all but those who bestow him with the palliative of rightwing demagogic lies that distort the source of his suffering by means of directing his rage at a host of scapegoats i.e., phantom socialists (and, of course, their OWS dirty hippie dupes) whose, schemes, he insists, have denied him his rightful place among the serried ranks of capitalism’s legion of winners. My apologies to Vince and all of his likeminded brethren of my native region: Although we rose from the same Southern soil, I’ve never had a knack for telling reassuring lies … for conjuring the sort of displaced emotional resentments and engaging in the brand of bigot-whispering that is the stock and trade of contemporary red-state conservatives. Conversely, I have shown some promise in encouraging people to embrace the reality of their circumstances, and passing on the hopeful news that they are stronger than they know. … Withal, the act of carrying the burden of denial in a marathon flight from feelings of angst and despair is the force that exhausts one’s energy and demoralizes one’s spirit. Accordingly, a depressing revelation waits at the margins of Vince’s (and other downtrodden true believers in the existence of free-market fairy dust) sense of awareness: that the energies of one’s life have been devoted to the maintenance of an elaborate lie; not only have your labors been for naught — but your sacrosanct convictions have laid the groundwork for the crime that was committed against you. You have spent your life as an accessory to your own robbery. Your faith in capitalism has left you in a similar position to the followers of a fanatical cult who were instructed to stand upon an isolated hilltop, so that, at midnight, as prophesied by their charismatic leader, their ranks will be lifted to heaven upon chariots of glinting gold … but who now stand stoop-shouldered before the breaking dawn, shivering into the cold light of day. Rather than admit error, one’s pride can compel one to blame phantom enemies for humiliating circumstances. Thus, as Vince’s prospects shrank, his gun collection grew to mini-armory proportions. Perhaps, he believes the weapon’s heft in his hands will stem the inexorable drift of his life into purposelessness; perhaps, his firearms will bestow a sense of security, in a life buffeted by uncertainty; perhaps, if he squints down the site of his rifle long enough, he can target the phantoms that made off with his hopes. Vince, old buddy, the solution is a great deal more accessible than that. To mitigate feelings of hopelessness attendant to isolation, the simple act of starting a conversation is helpful. … The doable act of leaving the house and attending an OWS function can serve to transform gut-gnawing rumination into fruitful dialog … thus, Vince, you will become enjoined in an ongoing conversation — a collaboration between your soul and the soul of life. In this way, we can become part and parcel of the story of our times, part of a living tale, unfolding in the eternal present that will affect the future in ways unseen. Still, I’ve learned, on an individual basis, I remain powerless against red-state belligerent ignorance of the collective variety. My experiences as a Southerner inform me the process of change will be difficult, because only cultural earthquakes alter the course of streams of surging stupid. Sure, start a dialog with even the most obtuse tea-bagger sort … attempt to convince him that the views he clutches are self-defeating … try to disabuse him of his calcified bigotry — but don’t be optimistic about the outcome of your efforts. Trouble is: Depressingly large numbers of people have invested a great amount of time, energy and identity in the maintenance of their reality-defiant attitudes. … There is just too much fragile self-esteem, bulwarked by brittle pride, at stake. While self-doubt is the worthy adversary of the wise, belligerent ignorance is the dubious ally of those who fear and resist self-awareness. Often, a journey towards self-knowledge and an attendant awakening to the nature of one’s condition can be unnerving and painful. The process is fraught with free-floating anxiety and weighted with saturnine regret. If I’ve made numerous life-determining choices based on my acceptance of proffered falsehoods, then I have lost many years constructing my life accordingly. The grief can be overwhelming. What alms does one chant into the grieving dawn on the morning after one’s illusions have died? This is why so many choose to spend their hours commuting through life in the company of the corpse of capitalism. Accordingly, the nation resembles the Bates Motel … its spree-killer government reflected in the acts of its murder-prone citizenry e.g., Staff Sgt. Robert Bales and guarded gate, vigilante flake George Zimmerman. Vince simply cannot wrap his corporate/police state colonized mind around the fact that, as is the case with any nation containing the vast amount of wealth inequity extant in the U.S., the elite will utilize the services of the police to achieve less than noble ends … that police repression and violence will be exercised at a level equal to the lack of legitimacy of the governing class. To Vince and any others still holding the quaint notion that the governing class of the U.S. possesses legitimacy, the actions of the NYPD testify to the contrary; their ongoing, brutal suppression of those attempting to exercise their right to dissent should disabuse you of that noxiously innocent fantasy. When justice has been banished from the precincts of power, it must be reclaimed in the commons. … Hence, occupy defiance. … Make yourself at home on the premises, because, if you are outraged by oppression and you long for a more just world, you will be spending a good deal of your time in this location. This article was published at NationofChange at: http://www.nationofchange.org/whose-recovery-1333202811. All rights are reserved. The endless war on terror in South Asia - with Afghanistan, Pakistan, Iran, the United States, Great Britain, Russia, India, France, Germany, Spain, all players - must seem like a senseless maze to the people forced to live with daily random violence in this region. In the United States, too many Americans have emotional yet uninformed responses: either "Kill our enemies before they kill us," or "Get out of Afghanistan now." The history of this region is more important than ever to study, as daily headlines inflame both sides without leading to solutions. It's been said that England's Queen Victoria gave Mount Kilimanjaro in Kenya to her grandson, Kaiser Wilhelm II of Germany, as a birthday present. Whatever actually happened, this story makes clear how casually European empire-builders assumed they could divvy up regions of the world under their control according to their whim. During her reign in the 1890s, the British made a colossal mistake, which remains a root cause of the instability in South Asia to this day. After losing two wars against the Afghans, and knowing they would never actually conquer Afghanistan as a colony, the British carved a deep scar across Asia that has never healed when the Durand Line agreement was drawn up in 1893 by Henry Mortimer Durand, foreign secretary of British India, and signed by Durand and Afghanistan's Amir Abdur Rahman Khan - supposedly to limit British, Afghan and (by proxy) Russian spheres of influence. The line - over 1,600 miles long - was drawn through the entire Hindu Kush mountain range in Afghanistan and the sovereign nation of Balochistan, which later became part of Pakistan. The ancient Greek historian Herodotus noted that most of this region was controlled by the Pashtuns, fierce tribal people with a moral code no less harsh than fundamentalist Islam's Shariah law. When British Lord Louis Mountbatten, the last viceroy of India, orchestrated the 1947 partition of India into the free nations of Muslim Pakistan and Hindu India, he unleashed a demon that could not be put back into any sized bottle. How could a man of his intelligence support a plan that would find a Hindu nation in the center of the Asian subcontinent and a Muslim nation split into two parts east and west of India - West Pakistan, and East Pakistan (today Bangladesh), over 1,000 miles apart? This could arguably be one of the dumbest ideas in recorded history. But Lord Mountbatten was not dumb. He was a bright man who played an active role in the Allies' victory in World War II. More likely, the concept of "divide and conquer" was so ingrained in British strategy that perhaps even he failed to anticipate the tortured labyrinth that was being created. The bells of freedom chimed across India on August 15, 1947, and they unleashed the largest migration of peoples in recorded history: Hindus to the new, free nation of India, and Muslims to the new, split nation of East and West Pakistan, which would endure less than 25 years before a genocidal civil war divided the nation into Pakistan and Bangladesh. Similar unrest continues to this day in Kashmir, and along the Durand line, the Pashtun peoples of the region (which had been considered part of Afghanistan for 200 years) were given only two choices - become part of the new India, or join the new Pakistan. The Red Shirt rebellion of 1947-1948, led by Abdul Ghaffar Khan, made it clear that most Pashtuns wanted no part of either nation. If they could not be a part of Afghanistan, they wanted their own nation of Pashtunistan. Violence continued for years, until the Pashtuns finally agreed to accept Muslim Pakistan over Hindu India - but only after making it perfectly clear to Islamabad that their territory, the Northwest Frontier Province (NWFP), would be managed completely by the Pashtun people themselves. No Pakistani Punjabi police or military in the NWFP! Pakistan agreed, and since that time has never attempted to control the region - no matter what President Musharraf claimed to be doing in his supposed quest to eliminate al-Qaeda after the attack on America on September 11, 2001. Leaders in Afghanistan, Pakistan, the Soviet Union and Saudi Arabia knew the reality, while the American CIA worked with Pakistan's Inter-Services Intelligence (ISI) and the American people remained clueless. Since the Partition of India and Pakistan in 1947, the Soviet war in Afghanistan in 1979-1989, the Afghan Civil War of 1992-1994, the Taliban takeover in 1996 of all but Northern Alliance leader Ahmad Massoud's and then-president Burhanuddin Rabbani's Pansjir Valley, to the US/NATO bombing of the Taliban in 2001 (more accurate and with far less collateral damage than more recent attacks), and now, the resurgent Taliban attacks against an occupying force of US and NATO troops - the government of Pakistan (influenced by the ISI and the military elite based in the Punjab) has stood by the Durand Line Agreement while Afghanistan has rejected it as invalid. To say that the resurgent Pashtun Taliban (still covertly trained and supported by Pakistan's ISI) has taken refuge from the US/NATO and Afghan forces across the Durand Line is to put it mildly. To say that US/NATO and Afghan soldiers have been thwarted by an enemy that crosses the line each night to be fed by the ISI and sleep with their families is an understatement. To say that Afghanistan would like to see its own flag raised over the Pashtun cities of Quetta, Peshawar and Dera Ismail Khan, as it had before the Durand Line Agreement in 1893, is to elicit raised fists and voices by Afghans determined to reclaim their homeland from the "Punjabis." To declare that the Durand Line has no real validity today raises questions that should be addressed by the World Court. The issues are hugely complex if one takes the time to engage in battle with all the beasts in the labyrinth. First, Durand never gave Amir Abdur Rahman Khan a translation of the Durand Line agreement. The one he signed was in English, and the Amir knew no English. The second issue is grounded in the agreement itself, which states that any changes in the terms must be signed off on by the sovereign nations involved. But the British never disclosed that the agreement was also signed by the sovereign nation of Balochistan. When Muhammad Ali Jinnah, founder of Pakistan, sought the agreement of the Amir of Kelat in Balochistan to become part of Pakistan in 1947, the Amir refused. The Pakistani army then invaded Balochistan and coerced the government to cede its authority to Pakistan. But according to the Durand Line agreement, Balochistan was a sovereign nation. To avoid sinking further into the morass of repercussions, we recall the statement of Afghan President Hamid Karzai, who referred to the Durand Line border as, "A line of hatred that raised a wall between the two brothers." If there is a crucial fact to glean from the subterfuge and confusion, it's that Pakistan does not want this border issue scrutinized by the world. The ongoing attempts by Pakistan since the early 1970s to control Afghanistan can be better understood in this light, as can its current support of the Taliban movement. If the United States and NATO grow even more tired of this war and pack up and go home, then what has been a violent quarrel between two points of view on a British fabrication over a century old could expand into a war between Pakistan (with its nuclear arsenal and friendly China) and Afghanistan (with its nuclear colleague India). In a war for South Asia, Iran would certainly play a pivotal role as well, as it borders both Afghanistan and Pakistan. Contrary to what the news media coverage implies, there are not just three entities (the Karzai government, the Afghan Taliban/al-Qaeda and the US/NATO forces) involved in the struggle for Afghanistan. There are many other players. First, there are the Afghan people themselves, who are not happy with how their government has been run, nor with the US military presence that has become an occupation. There is the distinct Pakistani Taliban, Tareq-i-Islami, comprising ethnic groups and agendas of their own. There is the Pakistani Army, comprising mostly soldiers from the Punjab region. There is the Pakistani ISI, also Punjab-based, which retains final control of the military. There is the Pakistani government in Islamabad, which must always walk a fine line with the ISI and the insurgents in the NWFP provinces. There are transnational corporate interests that owe allegiance to no nation or creed and always seek ways to profit from the confusion. Finally, there are the impoverished people of Pakistan itself, who really want no part of war, and only seek to live peacefully in the democratic nation promised them in 1947, a promise which has been continually thwarted by military coups - and the country could be on the edge of another. There is one big difference between a labyrinth and a maze. A labyrinth is an ancient spiral path with the purpose of focusing thought, with a destination at the center where one can stop and perhaps find peace. With a maze, there are many blind paths leading to dead ends. A maze has one way out, perhaps, but always remaining is the sense of being tricked, of having no exit. Let us hope that with some thoughtful, deliberate review of all that has gone before in the Af-Pak region, all the players in this new "Great Game," as Kipling called it, will successfully navigate the labyrinth in this volatile time. Suzanne Bauman, co-producer/director of "Shadow of Afghanistan," is an Academy Award-nominated independent filmmaker who has made specials and series for PBS and the networks for over 30 years. Jim Burroughs, director, producer and cinematographer, has filmed on six continents, documenting wars, expeditions and historical events. Burroughs has just completed his first nonfiction book, "Blood on the Lens," (Potomac Books), a memoir of the shooting of the film, "Shadow of Afghanistan." Despite reports this week that the Fukushima nuclear situation may be even worse than previously thought, the Nuclear Regulatory Commission (NRC) has given approval today for two combined licenses for two nuclear reactors in South Carolina, only the second time in the last three decades that new nuclear plants have been approved in the nation. The Vogtle nuclear power plant, which was given the first license since the Three Mile Island nuclear disaster in 1979 South Carolina Electric & Gas Co., a unit of SCANA Corp., and Santee Cooper, South Carolina's state-owned electric and water utility, will begin construction on the reactors in Fairfield County, S.C. at the Summer nuclear power site. 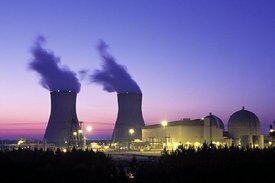 In February the NRC also voted to extend licenses to build two nuclear reactors at the Vogtle nuclear power plant in Georgia. Earlier this month, Amy Goodman noted that "Democrats and Republicans agree on one thing: they're going to force nuclear power on the public, despite the astronomically high risks, both financial and environmental." The Nuclear Regulatory Commission has concluded its mandatory hearing on the South Carolina Electric & Gas (SCE&G) and Santee Cooper application for two Combined Licenses (COL) at the Summer site in South Carolina. In a 4-1 vote the Commission found the NRC staff’s review adequate to make the necessary regulatory safety and environmental findings, clearing the way for the NRC’s Office of New Reactors (NRO) to issue the COLs. Friday’s decision is a major victory for the nuclear power industry, which has struggled for years to receive the necessary regulatory approvals to build new reactors. Jaczko was also the lone dissenting voice in February when the commission approved the Vogtle license. At the time, he raised similar concerns about incorporating the lessons learned from the Fukushima disaster into the license. About 1,000 workers are currently engaged in early-site preparation work at the V.C. Summer construction site. The project will peak at about 3,000 construction craft workers over the course of three to four years. The two units, each with a capacity of 1,117 MW, will then add 600 to 800 permanent jobs when they start generating electricity. The two AP1000 nuclear reactors will be fabricated by Westinghouse. V.C. Summer Station is about 20 miles northwest of Columbia, S.C., and includes the now-decommissioned Carolinas-Virginia Tube Reactor unit. The plant comprises one 1,000 MW Westinghouse 3-loop pressurized water reactor currently licensed to run through 2042. Water at surprisingly low levels; damage "worse than expected"
Radiation levels inside Fukushima's reactor 2 have reached fatally high levels, and levels of water are far lower than previously thought, experts say today. The current radiation levels are so high that even robots cannot enter. Tokyo Electric Power Co. (TEPCO) says that new robots and equipment will need to be developed to deal with the lethal levels of radiation. TEPCO spokesperson Junichi Matsumoto told the Associated Press, "We have to develop equipment that can tolerate high radiation" when locating and removing melted fuel during the decommissioning. At ten times the lethal dose, the radiation levels are at their highest point yet. At the current level of 73 sieverts, the data gathering robots can only stand two to three hours of exposure. But, Tsuyoshi Misawa, a reactor physics and engineering professor at Kyoto University's Research Reactor Institute, told The Japan Times, "Two or three hours would be too short. At least five or six hours would be necessary." He added that "the shallowness of the water level is a surprise, and the radiation level is awfully high." DURHAM, N.C. - November 10 - Nuclear engineer Arnie Gundersen has documented at least six areas of unreviewed safety concern involving the Westinghouse AP1000 nuclear plant design based on the ongoing Fukushima disaster, and he says these problems require full technical review by the U.S. Nuclear Regulatory Commission before the plant design can be “certified.” Today public interest groups filed his report – which expands on problems identified by a federal task force – with NRC commissioners who are considering a final vote on the plant design without responding to a long list of problems raised earlier by experts within and outside the industry. The report was commissioned by NC WARN and Friends of the Earth, who say the NRC staff has avoided resolving the earlier problems – along with others the NRC’s Fukushima Task Force said apply to new reactors – in order to meet the nuclear industry’s AP1000 construction schedule. In a legal motion accompanying today’s report, the groups say federal regulations require correction of the multiple problems during the design certification phase – not after full construction of the AP1000 begins in Georgia and South Carolina. increase your site popularity in record time. Why Did Obama Help Lock Up a Yemeni Journalist?